Ford Philippines is bringing to market two of its greatest American hits: the all-new 2018 Ford Expedition and the revised 2018 Mustang at MIAS. 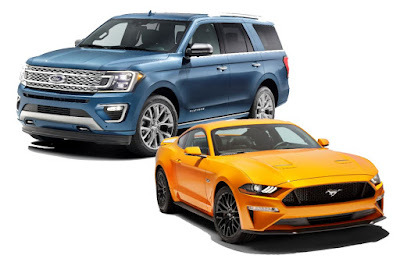 Built from an all-new high-strength aluminum alloy body and re-designed steel frame, the Expedition offers unparalleled strength while managing to shed some 150 kilograms. Plus, it still offers best-in-class technology and convenience features. With seating for up to eight people and their gear, this full-size SUV makes modern family adventures more comfortable during short and long trips alike. It’s the first large SUV to feature a sliding second-row seat with tip-and-slide functionality. This proves easy access to the third row without the need to first remove a child safety seat. Once in the third row, even adults will appreciate more legroom and reclining seats. Expedition’s second- and third-row seats can be quickly folded flat with the push of a button to open up a cargo area wide enough to handle a sheet of sheet of plywood and other gear. Powered by a 3.5-liter EcoBoost V6 with auto start-stop technology and a new 10-speed automatic transmission, the 2018 model is the most powerful model ever. For surefootedness on any terrain, a new electronic limited-slip differential with Intelligent 4WD offers improved off-roading capability. Plus, with Terrain Management System, drivers can choose between different drive modes for optimal vehicle handling. Meanwhile, the world’s best-selling sports coupe gets a host of improvements that make it the most advanced Pony Car ever from Ford. The 2018 Mustang improvements include more powerful engines, better handling, a host of both technological and aesthetic improvements, and the availability of a manual transmission for the first time ever. At the Mustang’s core though is performance and the 2018 model offers a heightened level of it. For handling, it has new shock absorbers for better ride control and a new cross-axis joint in the rear suspension for increased lateral stiffness. New stabilizer bars also bring sharper response and handling. As for the engines, the 2.3-liter turbocharged EcoBoost engine now offers transient overboost while the 5.0-liter V8 offers more peak power thanks to a new dual-fuel, high-pressure direct injection and low-pressure port fuel injection. This delivers robust low-end torque, high-rpm power, and improved fuel efficiency. Both models receive a new 10-speed automatic while the V8 gets the option of a 6-speed manual. For 2018, the Mustang’s design is decisively more athletic with a lower, remodeled hood and grille that helps create a leaner look. It features an all-LED lighting system for the first time as well as newly positioned hood vents. The rear also gets revised with new LED tail lights, and bumper. The EcoBoost-powered Mustang is easily spotted thanks to its dual exhaust tips while the V8-powered Mustang GT gets quad-tip exhausts. Inside, the Mustang features Ford’s first 12-inch all-digital LCD screen in the dashboard. This customizable instrument cluster can be personalized offering three separate views: Normal, Sport, and Track. A Mustang MyMode also allows customers to save their favorite drive settings including suspension and steering preferences. There are also improved touch points for a more premium look and feel. For example, the center console adds a hand-stitched wrap with contrast stitching and padded knee bolsters, while door handles, rings, and bezels are now finished in aluminum. The seats have also been restyled offering new patterns and colors. The instrument panel also sports an updated Mustang badge. Sir Uly? What about the pricing? Same parin ba? We posted the full specs and pricing now. Thank you Sir Uly. There it is! Im getting the Ecoboost stang! Hope it comes with the orange fury color. Ill post it soon brad. :) lets see who wishes between us two. Congratulations bro! That's how you do it. Kindly us an update regards to your ownership experience, if you don't mind. Pathetic. One guy is using another account to reply to his comment in order to defend his delusions. Lol we will see my boy. :) stay tuned. Bookmark this page. hi sir uly! can you please ask ford if they can sell ford f-150 raptor? siguro mas magiging affordable sya compared sa grey market. They wont offer the F-150 here. The official spec sheet they gave indicated halogen headlamps and halogen foglamps. At that price and still halogens? What a ripoff. Hindi talaga kaya ang Halogen Lights for Night Visibility. Very poor talaga ang Halogen. Mas Better pa ang LED Lights compared to Halogen Lights. Less Accident na Less Crime pa. ang LED Lights. Envy and insecurity will always thrive in the comments section. And there are also comments which are full of BS and pretensions because its the internet. And there are those who are envious because others can and u cant. Yep its the internet alright. Apparently yung Mustang ecoboost only comes with magnetic gray color ito lang ang available color. And race red is for the v8 variants here in Philippines. Im kind of disappointed. Im still in talks and lets see if I can get the color i want for the car.